The recent controversial appointment of the Inspector General [IG] of the Nigerian Police Force to the post of Chairman of the Panel Committee charged with the investigation of the top Nigerian officials involved in the Halliburton bribery scandal – according to information gathered by Ukpakareports.com – is said to be part of a comprehensive ploy by the Attorney General of Nigeria in the person of Mike Aondoakaa to influence and/or coerce President Umaru Yar'dua into extending Mike Okiro's tenure's to extend pass its June 2009 expiration date. As Ukpakareports.com was recently made aware, both Mike Aondoakaa and Mike Okiro share an intimate friendship that goes beyond the call of presidential duty of their offices. Previous reports have paired both men as partners in corruption and thus are said to share an invested interest in retaining their respective positions. Both are known in the Abuja night scene to drive around in the same vehicle alone as they take in the “social delights” that Abuja offers to top political players in Abuja. Mike Aondoakaa's concern was heightened following internal pressures mounted by the anti- Okiro lobbyists to have Okiro replaced immediately his tenure expires in June 2008. 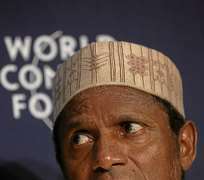 This was particularly disturbing to Aondoakaa following President Umaru Musa Yar'dua failure to make the announcement as expected following his meeting with the members of the Federal Executive Council [FEC] that was held on Wednesday April 1, 2009. Information received by Ukpakareports.com of what transpired at the FEC meeting indicated that President Yar'dua had already concluded on the decision to extend Mike Okiro's tenure prior to arriving to the meeting – but was meet with stiff resistance by members of the FEC. In particular, the members of the FEC who do not appreciate the excess influence exerted by James Ibori over the Yar'dua's administration, seriously objected to the possibility of extending Mike Okiro's tenure. It should be recalled that both Mike Aondoakaa and Mike Okiro were both put in their respective positions by James Ibori. And it is for the reason to mount a fight against James Ibori's influence that the vocal majority within the FEC mounted just enough pressure to push President Yar'dua into recoiling from his decision. In an attempt to avert what appeared an impending removal, Mike Okiro was reported to have sought the assistance of Mike Aondoakaa. Using his influence as the Attorney General of Nigeria, Mike Aondoakaa reached for the immediate weapon and/or tool within his reach – and at that moment the Halliburton bribery scandal freely presented itself. And the Attorney General immediately commandeered all matters concerning the case – and made a considerable effort at distancing the Economic and Financial Crimes Commission [EFCC] from nearing the case. Through his commandeering of the Halliburton case, Aondoakaa was able to carve out a niche for his friend - that may help prolong the stay of his partner in corruption [Mike Okiro] at the position of IG. According to his plan of constituting the committee, instead of placing the Chairperson of EFCC as the head of the newly formed investigatory committee to work on the bribery case, Aondoakaa appointed Mike Okiro. And with Mike Okiro's appointment, he will remain ever present in the public domain to influence Yar'dua to allow him stay on. The committee was given enough time to conduct the investigation – enough to overlap Mike Okiro's date of retirement. That notwithstanding, political players within the power corridors in Abuja, as Ukpakareports.com learnt - harbor doubts that President Yar'dua will eventually succumb to the plot hatched by Aondoakaa – and to this extent have begun to work for possible alternative to Mike Okiro should President Yar'dua finally decide on replacing Okiro. But while the political power players remain uncertain as to what Yar'dua's final decision will be, they however point to Yar'dua's character as “wobbly enough to allow the AG to trick him into changing his mind”. The short listed officers which they have tapped on as possible replacement include; Uba Ringim, Ogbonna Onovo, and John Hamza Ahmadu, all of whom are deputy inspector general. But sources point to John Hamza Ahmadu as the preferred choice of James Ibori [who most believe will determine who replaces Mike Okiro].